With your rental car from Tampa TPA Airport you can explore the beautiful Florida individually and at your own pace. On Driveboo.com you can compare prices of car rental companies on Tampa Online airport and find the best way to rent a car while on holiday or on a business trip. Book early to benefit from the best prices and selection of rental cars in Florida. Where can I find my rental car at Tampa Airport? Tampa Airport has an unusual structure and architecture. It has no shared buildings like most airports. Instead, there is a central resident terminal (Landside) and four satellite terminals (Airside) designated A, C, E and F in which the gates are located and over which one enters the plane. The connection is made by a driverless train with small gondolas. The system of colour coding should also be unique. Since its opening on 15 April 1971, Tampa International Airport has used a special colour coding system throughout the terminal area. The baggage reclaim and ticket counters are marked in blue and red. The color codes were also given names based on aerospace pioneers to support color-blind people. A taxi service from Yellow Cab and United Cab is available outside the baggage claim area. Both companies charge the same fares, the basic fare is $2.50 plus $2.40 per mile. 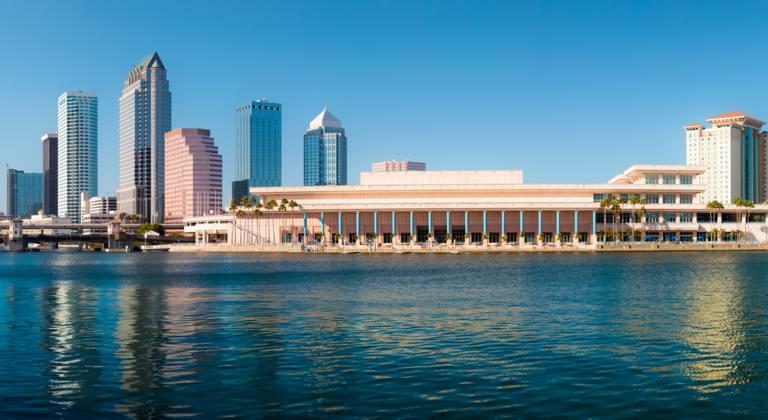 The minimum price from the airport is $15, and there is a fixed price of $25 in downtown Tampa and to the cruise terminal. Limousines and group taxis are available by prior reservation or on site. Closed and air-conditioned waiting rooms at the end of each baggage claim area are available to passengers during the waiting period for a group taxi. The company is SuperShuttle and operates in the counties of Hillsborough, Pinellas, Pasco and Hernando. There may be discounts for children or groups to the same destination, prices include up to 3 pieces of luggage per person. The bus stop of the Hillsborough Area Regional Transit (HART) is located at the western end of the Red Luggage Claim area near volume 15, with a timetable of destinations and times at the bus stop. The Greyhound long-distance bus terminal is located in downtown Tampa on 610 Polk Street near Pierce Street and can be reached from the airport by taxi or group taxi. The bus stops for boarding during organized bus trips are located in the bus stops at the Red 1 and Blue 2 Transport Centre, which are located in the western area of the arrivals building. Tampa International Airport is located just five miles west of downtown Tampa on the east coast of Tampa Bay. From St. Petersburg, Clearwater, the beaches and from the west take Interstate 275 North to exit 39B and follow the signs to the airport. From Ocala, The Villages and the North, take Interstate 75 South to Interstate 275 South, exit 39 and follow the signs to the airport. From Sarasota, Venice, Sun City Center and the South, take Interstate 75 North to Interstate 4, drive west on Interstate 4 towards Tampa to Interstate 275, drive south until exit 39 and follow signs to the airport. The airport and the city of Tampa can proudly claim to be the gateway to the west coast of Florida. Whether you are visiting Sunshine State for the first time or you are here again to see what's new. You will find countless opportunities to spend the day on the fabulous west coast of Florida. From the world-famous beaches of Pinellas County to the fabulous shopping, restaurants and attractions of Tampa and Hillsborough County. Everyone will find something to enjoy their stay in the surroundings of Tampa Bay.